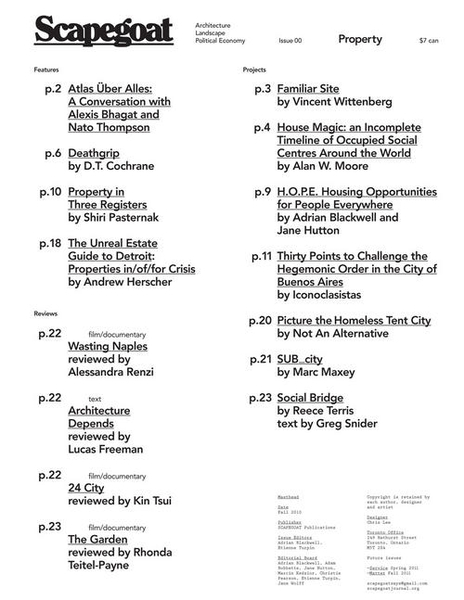 SCAPEGOAT is a bi-annual journal that engages the political and economic elements in the practice of architectural and landscape design. Historically, the figure of the scapegoat bears the burden of the city and its sins. Walking in exile, the scapegoat is also freed from the city and its walls. At present, with little land left unmapped, and with the processes of urbanization central to political struggles, SCAPEGOAT moves through the city – an outcast whose burden is also the freedom to see otherwise, from other angles, and from uninhabited positions. 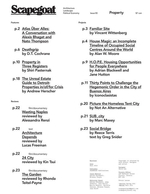 SCAPEGOAT examines the relationship between capitalism and the built environment through connected psychic, social, and ecological registers. It confronts the coercive and violent organization of space, the exploitation of labour and resources, and the unequal distribution of environmental risks and benefits. In each instance, it returns to the politics of making and the political that must be made. SCAPEGOAT attends to both physical manifestations of and cultural and theoretical influences on design. It brings together critical reviews of contemporary practices, historical research and theoretical inquiry. Through architecture, landscape architecture, and urbanism, the journal engages mechanisms operating above, below, and behind these disciplines, such as infrastructure, governance, regional planning, land speculation, and militarization.